I made this for dessert ! Mango Mochi …I can’t believe it after having such a heavy dinner…well I could not resist making this for I love anything mango. I know that mango is best eaten fresh but at times we have to be more innovative and creative..ahem but I have been wanting to make this , since the day I stumbled upon this mango goodness mochi :) Sorry, I can’t remember where I stole this recipe from :p ,anyway thanks to the owner of this recipe…it could be from one of your blog :p It is easy and needs no professional skill. I still have a few mangoes left in the fridge drawer so I might as well try this recipe out. Mmmmm not bad, it is soft, fragrant and it taste good. A good after dinner dessert…chilled it before serving. It taste better chilled :) Take note, I did not microwave it but I steamed it for 20 minutes instead. with the after taste of coconut goodness ! sweet mango bits filling...Mmmm yummy! 1. In a porcelain bowl, combine flour, juice and sugar. Stir to mix well. 2. Cover with a cling wrap and microwave for 2 mins. Remove and stir well. Return to microwave for another 30 seconds. Stir-well and check for doneness. If not put it back for another 30 seconds, be careful not to burn it. In most cases, the first 30 seconds after the initial 2 mins should be enough. 3. Flour the working surface with coconut and use a spoon to drop a ball of mochi on top and quickly cover it with coconut. 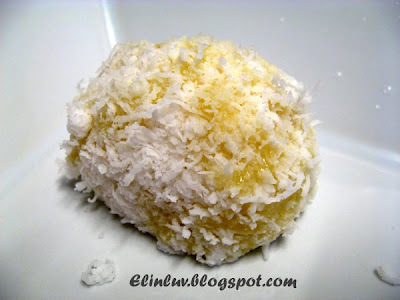 Wrap the mango inside and cover with more coconut. Shaped into balls. Moisten if necessary to close the edges, Pop in your mouth and enjoy! Mango flavour mochi! What a lovely idea. Great for summer... YUM! I love mochi and mangoes. I will be waiting for mango season and I will definitely make this one. I love mango mochi, too!! 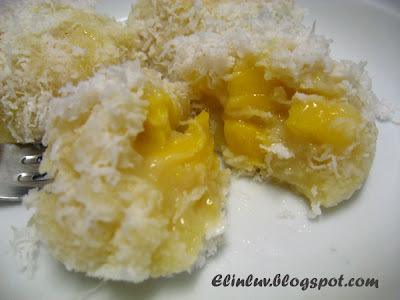 When mango season hits, I'm sure going to make some to satisfy my craving for these chewy babies!! Keep up the good work! I love your style of writing about foods LOL! Mochi and Mango!! Elin, you for sure know how to pamper your family! yum!! Love the mango pieces! These mango Mochi look "kawaii"/beautiful and "oishii"/delicious! tempting stuff. 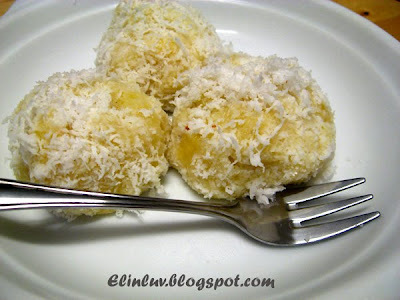 looks like onde-onde, but with fresh and sweet mangoes as fillings. Awesome, must be really delicious, think steaming the glutinous flour mixture is a safer bet. Lovely pics too. Hi Zurin , miss your posts on baking....gambate! Mochi is awesome because it not only tastes good, it's fun to eat... and now, I can say fun to make! Mango Mochi? Just heard it the first time. You really hardworking! we're going to make some mochi soon..thanks for the inspiration! 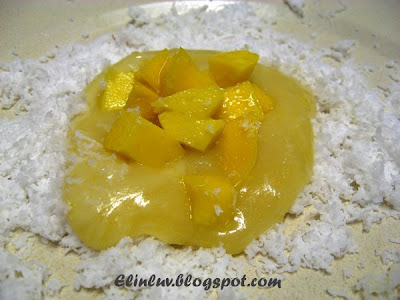 Hi Mae, mochi can have many varieties of fillings and mango is one of them...flavorful and tasty! Hi Ravenous Couple, you welcome! I am sure you will love it! I think this is the most gorgeous mochi I've ever seen so far! Love the fresh fruits in it. I bet my son will love it.